a tooth-forming sac that arises from the epithelium of a tooth bud and dental lamina. The kinds of follicular cysts are dentigerous, multilocular, and primordial. The most common cyst of the ovary, which develops when ovulation does not occur and an egg-bearing follicle does not rupture and release the egg, but rather continues to grow, becoming a thin-walled, serous fluid-filled cyst, measuring up to 5 cm and lined by granulosa cells. Usually asymptomatic; less commonly (in about 1/4 of cases), causes sharp unilateral pain (“mittelschmerz”) in the middle of the menstrual cycle, coinciding with ovulation. 1. An odontogenic cyst that arises from the epithelium of a tooth bud and dental lamina. n an odontogenic cyst that arises from the epithelium of a tooth bud and dental lamina. pertaining to or emanating from a follicle. spaces formed by the confluence of small lakes of follicular liquid in the ovary. see black hair follicular dysplasia. 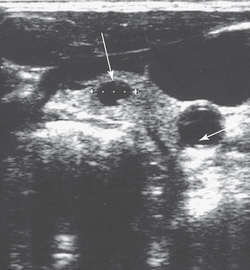 1. see cystic follicle; cystic ovarian degeneration. 2. retention cysts in the hair follicles are common, resembling pustules. in Siberian huskies; a late-appearing, symmetrical alopecia, affecting mostly the guard hairs. chronic disease in young racing horses; of importance as a disruption of training; characterized by frequent cough, dyspnea with exercise, poor exercise tolerance. formed by excessive keratin in an inactive hair follicle. Q. my little sister have her periode badly.it stay for a months somethimes what can cause that? Since she start having her periode is been a problem and anybody cannot give us a straight answer she's been a hospitolize and had to have blood transfussion she's always anemic and sh'es been putting on pills but her body did not react good to it we had to stop.Sometimes she fells so weak that she pass out.The doctor say she may need to hospitolized again she doenst want to and we dont know how to help her she just wants a normal teenager and get ready to go away to collegebut we are scare that may not happens,she loves school so much and she feltthat she will never be a normal woman like everybody and scare that she may never have children one day i tell her to not be worry about it but i feel helpless.Please tell me what's wrong with her since nobody seems to give us a straight answers.Is follicular cyst of ovaries can put her in so much pain. For the full article: http://health.nytimes.com/health/guides/symptoms/menstrual-periods-heavy-prolonged-or-irregular/overview.html Hope this helps. Among histological typing of tumors in our study, the most common benign tumors were follicular cysts 25% followed by serous cyst adenoma 15% and mucinous cyst adenoma 13%. Out of these 22 cases 17 had follicular cysts, 2 had luteal cysts and 3 had ovarian cyst with torsion. On per-rectal examination, follicular cyst was present on right ovary with the size above 1. In present study; out of all benign masses 53% were simple follicular cyst and out of all malignant masses 65% were serous cystadenocarcinoma and 35% were dysgerminoma. The present communication reports CPV in a Khillar breed and its correction via manual rupture of follicular cyst. Histopathology showed left side mucinous cystadenoma and right side follicular cyst. Cystectomy was performed, and histopathology confirmed the diagnosis of simple follicular cyst. But sometimes, it may be filled with fluid or blood, causing the corpus luteum to expand to form a cyst, which is less common than the follicular cyst. Corpus hemorragicum and follicular cyst are also seen. Follicular cysts are a common finding in nearly all women of reproductive age, while corpus luteal cysts are particularly prevalent in early pregnancy before regressing after 7-8 weeks gestational age. suggested that the granulosa cells in follicular cysts of PCOS in women may be abnormal. Among non-neoplastic lesions follicular cysts were seen predominantly common and were seen predominantly in the 36 to 45 years' age group, which was concordant with the study of Kanthikar et al.